VT-8, Hornet’s torpedo squadron, had been slated to be the first unit to convert to the Grumman TBF Avenger, the new replacement for the TBD Devastator. A detachment of the squadron under Executive Officer Harold H. Larson had been sent stateside, and had collected a total of 21 of the new bombers, and had arrived in Oahu in late May – too late to join the Hornet before she left for Midway. On the 1st of June, a TBF detachment of six torpedo bombers under Lt. Langdon K Fieberling flew the 1,300 miles from Oahu to Midway, each aircraft fitted with a bomb-bay fuel tank to enable them to make the long over-water flight. Larson himself had pleaded to lead the flight in person, but had been ordered to remain at Pearl with the bulk of his unit. On June 4th, as they had every morning since arriving on Midway, the VT-8 detachment sat waiting in their planes as per standing orders with engines warmed up. When the incoming Japanese strike was detected by a PBY, with verification coming soon afterwards from Midway’s radar station, the detachment received orders to clear the field and head towards the reported enemy carriers. VT-8’s Avengers were followed by four B-26s, two each from the 22nd and 38th Bomb Groups. All ten of these aircraft were lugging a single Mark 13 torpedo, a weapon of decidedly uneven quality. The Army bombers had never dropped a ‘fish’ in anger before, but there were high hopes for the speedy B-26. Despite the Army and Navy torpedo bombers flying separately, the two groups arrived near Kido Butai almost simultaneously, from different directions. Arriving just after 0700, the TBFs and B-26s attacked together, giving the appearance of an ‘anvil’ torpedo attack to the watching Japanese – but they were in fact uncoordinated. The Army B-26s went for Akagi, Nagumo’s flagship, whilst VT-8 headed for the Hiryu. Before they bombers reached torpedo range, they were spotted and attacked by patrolling fighters. Akagi’s fighters dove in to attack the B-26s, but found the Marauders very tricky targets – one of the Zeros was soon shot down by defensive fire. In return a B-26 was set alight and fell burning into the sea, its entire crew lost. The rest, facing heavy anti-aircraft fire from the Japanese carriers, dropped their torpedoes too far out and gave the Akagi no particular trouble in dodging the oncoming fish. The worst moment came when two of the American bombers buzzed the carrier after dropping their torpedoes – Lt James Muri’s plane passed over the flight deck, killing two crewmen and damaging one of the ship’s transmitters by strafing. A second B-26 piloted by Lt Herbert Mayes, apparently badly damaged, attempted to crash-dive into the Akagi’s bridge but missed by mere feet before crashing into the ocean. Thus Admiral Nagumo’s life was spared. The two surviving B-26s, both heavily damaged, returned to Midway two hours later. VT-8 too managed to shoot down at least one Zero on their approach. The pilots had taken the sensible precaution of opening their bomb bay doors before reaching the Japanese fleet, a measure designed to eliminate the risk of battle damage to hydraulic systems preventing a successful torpedo drop. Nothing could be done about the incoming Zeros however, as the fighters made repeated slashing attacks that tumbled five of the Avengers into the sea. 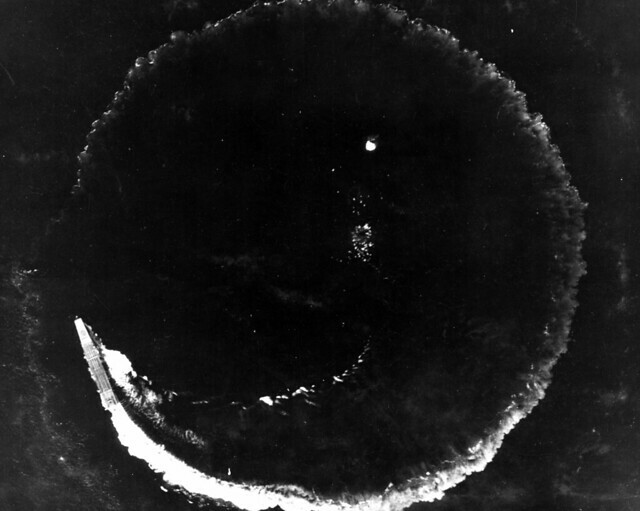 Only the aircraft piloted by Lt(jg) Albert Earnest, with one gunner dead and the other unconscious, survived long enough to drop its Mark 13, albeit from far too high and far out to trouble the Hiryu. Somehow Earnest managed to fly his badly damaged TBF back to Midway, where he crashed landed on the runway. Whilst the Japanese were fending off these initial attacks, an E13A floatplane from the heavy cruiser Tone (which had departed late) reported sighting an American surface force. The message arrived at 0730, and was followed up at about 0830 with an amplifying report that a carrier was ‘bringing up the rear’. This was most likely Fletcher’s Task Force 17, and the carrier was the Yorktown. This report led Nagumo to reverse his original decision to arm his reserve strike with bombs for another crack at Midway, and to replace them instead with the original anti-ship torpedo loadout, a slow process with the carriers under almost constant air attack. The next Midway-based unit to locate and attack the Kido Butai were Major Lofton R. Henderson’s VMSB-241. Henderson led 16 SBD Dauntless dive bombers, many crewed by very inexperienced Marines – many pilots had very little training time in the SBDs, having only joined the squadron 10 days before the battle began. The aircraft themselves had only been delivered to Midway a few days before, and fuel shortages on the island had curtailed training flights so for most of the flyers, this would be the first time they had dropped a bomb from a Dauntless. With this in mind, Henderson had coached his pilots not to make difficult, high-angle dive-bombing attacks, but to substitute instead, the slower, easier ‘glide-bombing’ technique. VMSB-241 took off at 0610 in the general pell-mell scramble to clear the field after Tomonaga’s incoming strike was detected. At 0748 lookouts on the Japanese carriers spotted the new interlopers, and shortly thereafter Zero fighters from Soryu moved to intercept them. Henderson’s plane was one of the first to go down, caught be the Zeros on the first pass – his SBD tumbled towards the sea, on fire. Capt Elmer Glidden, second in command, took over. The Marines split into two groups, the first heading for the Hiryu – observers on the Akagi saw the Hiryu disappear behind the waterspouts from two bombs that landed close aboard, but the carrier was not hit and emerged from the spray unharmed. The other group went after Kaga and scored three more near-misses, but again the Japanese flattop escaped damage. 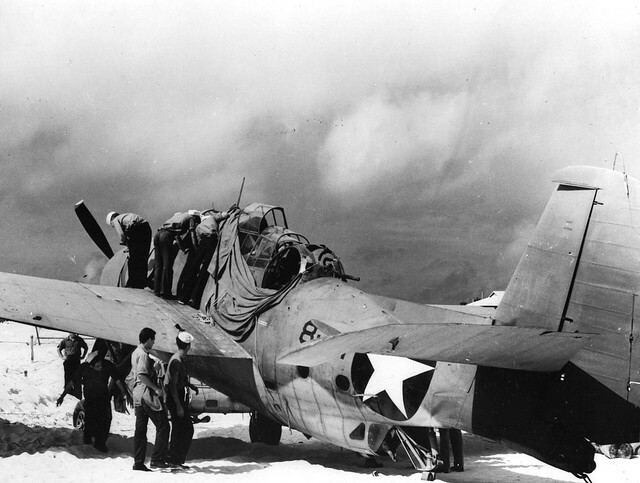 Only eight of the SBDs managed to limp back to Midway, most with battle damage and a few carrying wounded crew. Despite claiming three direct hits, the Marines had not landed a single bomb on target. Hot on the heels of the Marines came 14 Army B-17 bombers under LtCol Walter C. Sweeney, who had been ordered to repeat his attack of the previous day on the Tanaka force. En route Sweeney heard the report of Japanese carriers and led his bombers for that juicier target instead. At 0754 Akagi’s lookouts spotted the incoming bombers, at first incorrectly identifying them as carrier-based planes. The B-17s split up into small groups to begin their bomb runs, with a few even attacking individually. Japanese aircraft carrier Soryu circles while under high-level bombing attack by USAAF B-17 bombers from the Midway base, shortly after 8AM, 4 June 1942. This attack produced near misses, but no hits. U.S. Air Force Photograph. The Flying Fortresses attacked from high altitude, 20,000ft. There had been high hopes during the development of the B-17 that it would prove to be a potent ship-killer, but in this test the big bomber would fall far short. Three groups selected targets, and one each went after Akagi, Hiryu and Soryu. 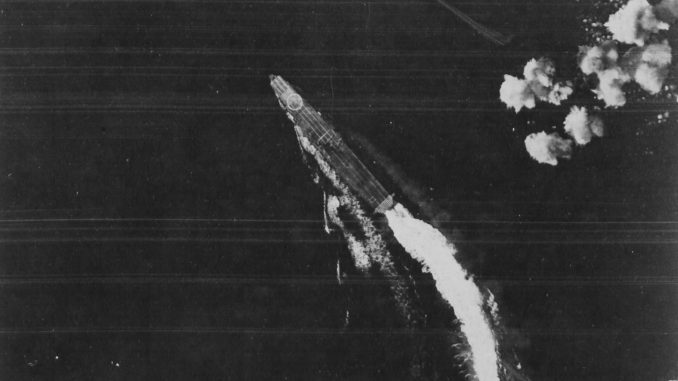 The extreme altitude of the attack meant that the bombs would fall for over a minute, giving each carrier plenty of time to spot the bombs being dropped before executing a radical turn. Cloud cover also frustrated the Americans, forcing many of the B-17s to make individual runs after their first effort was spoiled. During over 20 minutes of attacks the three carriers managed to avoid damage, although both Hiryu and Soryu were near-missed. A handful of Zeros managed the climb up to meet the Fortresses, causing damage to one. The net group of Americans to enter the Japanese shooting gallery were the 11 SB2U Vindicators of VMSB-241, led by Maj Benjamin W. Norris. The Vindicators were old, cast offs from Navy units, and they had seen better days – many were in a poor state of repair with loose pieces of fabric held on with tape that resulted in the Marine ground crews dubbing the aircraft “Wind Indicators”. As Norris led his men towards Kido Butai, he realised that his vulnerable charges had no hope against the heavily defended carriers and instead selected a nearby battleship as their target. This turned out to be the Haruna. Again using the shallow glide-bombing approach, the Marines swooped down in line astern and claimed two direct hits and two near misses, but in reality caused only minor damage to the battleship. Two Vindicators were shot down during the attack, and two more ran out of fuel before the managed to make it back to Midway. Midway had therefore completely shot its bolt against the Japanese carriers. 52 aircraft had set out, but 19 had failed to return, and no appreciable damage had been done to the enemy in return. Japanese air defences had held firm and taken a fearful toll on the unescorted bombers. The most that could be said of the attacks is that they kept the Nagumo under pressure, and distracted him at a time when he needed to make clear-headed decisions, especially when it emerged that American fleet units were well within range. Next, it was the turn of the carrier-based torpedo squadrons to try their luck running the gauntlet of Zeros and anti-aircraft fire.